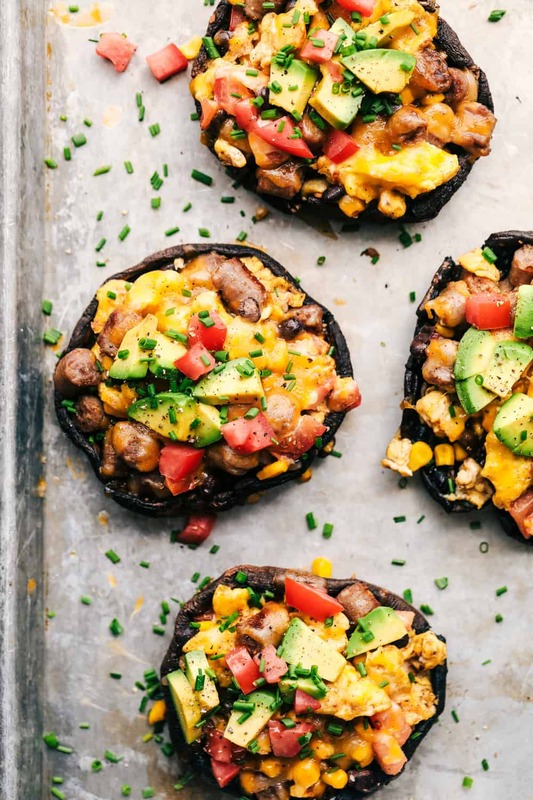 Southwest Sausage and Egg Stuffed Portobello Mushrooms have eggs, black beans, corn, tomatoes and are topped with ooey gooey cheese! An easy to make hearty breakfast for your family! The summer is quickly winding down and school will be back in session before we know it. Even though we have been keeping ourselves pretty busy this summer, once school starts life gets crazy. I have three kiddos to get out the door to school. From my oldest son who will be starting high school, down to my four year old that will be in preschool three mornings a week. One thing remains consistent in our family– the importance of starting the morning with a well balanced, protein-packed breakfast. It is the most important meal of the day! Smithfield is here to make that transition from those slow summer mornings to the rushed school mornings a breeze. Morning breakfast isn’t the same in our house without fresh breakfast sausage. And why only treat yourself to this protein kick on the weekends? Smithfield makes it easy to have freshly cooked sausage in no time at all. 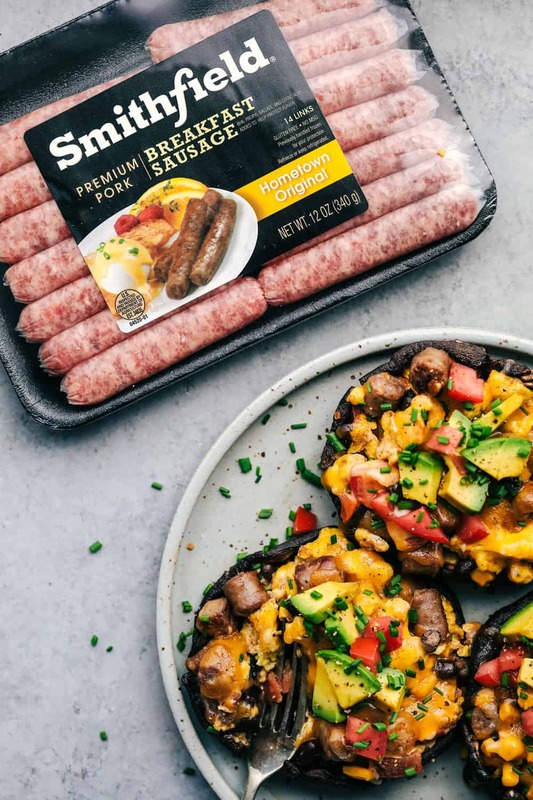 Just throw the sausage in the skillet and you will have sizzling breakfast sausage in no time at all! This school year, be sure to pencil in breakfast on your back to school list to ensure that your kids are getting the proper nutrition that they need to start the day off right. Studies show that when students have a hearty and wholesome breakfast in the morning, they are more likely to attend school and perform better on standardized tests. In fact, when students don’t get the food they need, 76% of teachers see a poor academic performance and 80% see the students lose the ability to concentrate. This is why it is so important to eat breakfast and start the day off right. Smithfield is partnering with No Kid Hungry for a second year in a row, doubling its donation to two million meals to support the organization’s in-school breakfast programs to ensure the 1 in 6 American children struggling with hunger can check this item off their list, too. We can also get involved! Share your breakfast on social media using the hashtag #BreakfastPower and for every breakfast shared, Smithfield will donate enough for ten meals to No Kid Hungry — helping more kids get access to healthy meals. To learn more visit www.smithfield.com/nokidhungry. For this recipe, I used Smithfield Fresh Breakfast Sausage Links. 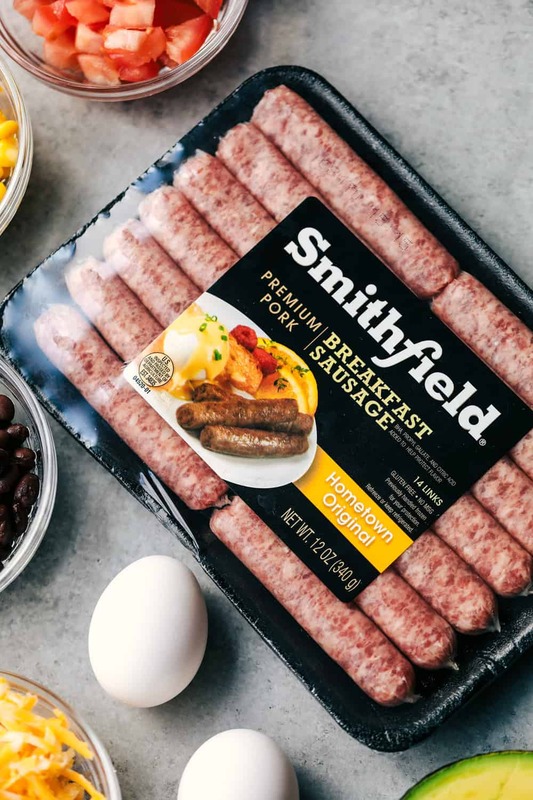 They are available in flavorful links, rolls and patties, Smithfield Fresh Breakfast Sausage is a great addition to your favorite breakfast dish. Available in Hometown Original, Bacon and Maple, and each variety is made with premium quality pork, and they’re gluten free and contain no MSG, so you can feel good adding this breakfast staple to your plate. They are our families favorite sausage links to buy. They are fresh, and not frozen quality and flavorful links. I even like to make a big batch at the beginning of the week, and the kids can quickly heat them up before school or I can add them to the recipe that I am making. How do you prepare portobello mushrooms? Take off the stem from the inside of the mushroom. They should break off easily. Use a spoon and gently scrape the gills from the inside of the portobello mushroom. Discard the gills. Lightly brush olive oil on the portobello mushroom and sprinkle with salt. Roast in the oven at 400 degrees for about 5 minutes until they soften. 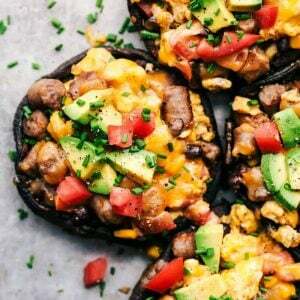 How do you make Southwest Sausage and Egg Stuffed Portobello Mushrooms? To start, slice your fresh sausage links into 1/2 inch pieces. Cook in a medium-sized skillet over medium-high heat until no longer pink and cooked throughout. Set aside on a plate. Add your lightly beaten egg to the hot skillet and scramble until they start to form. Add in black beans, and corn and continue to cook until eggs are ready. Add in sausage and tomato. 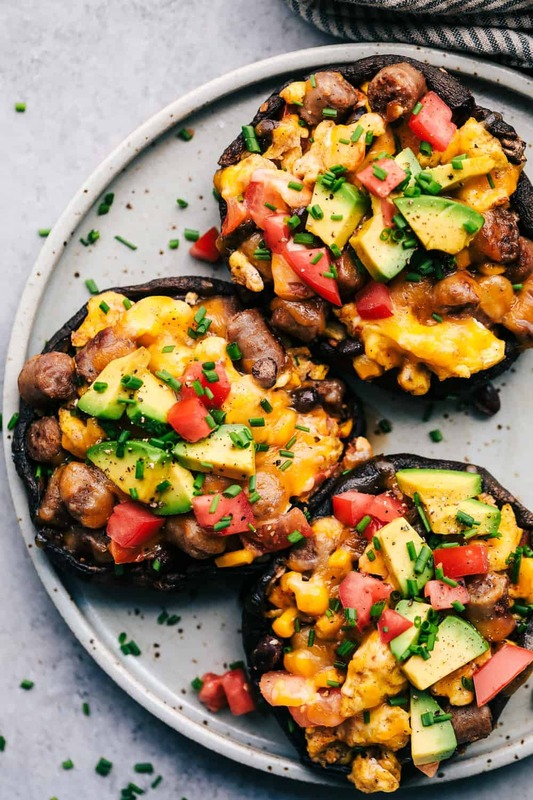 Fill your portobello mushrooms with the mixture and top with shredded cheese. Put back in the oven for about 2 minutes until the cheese melts. Top with desired toppings. We love portobello mushrooms at our house! 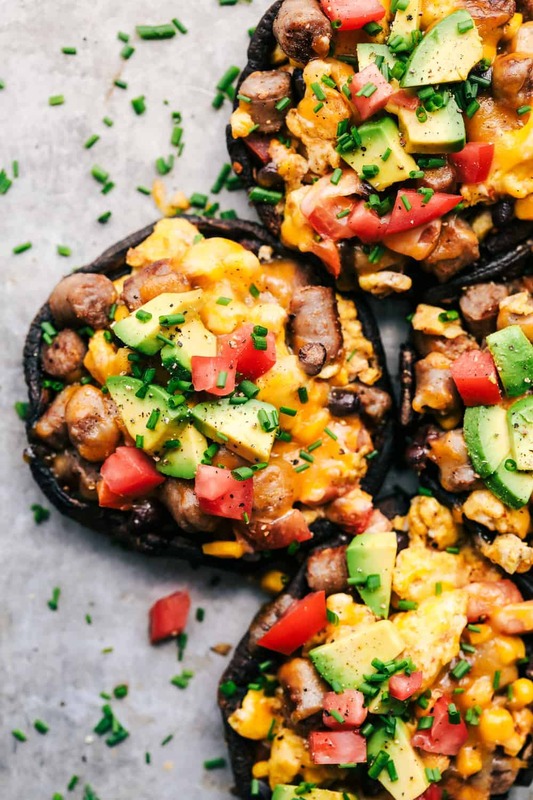 It is so nice and convenient to have your entire breakfast stuffed into a mushroom. 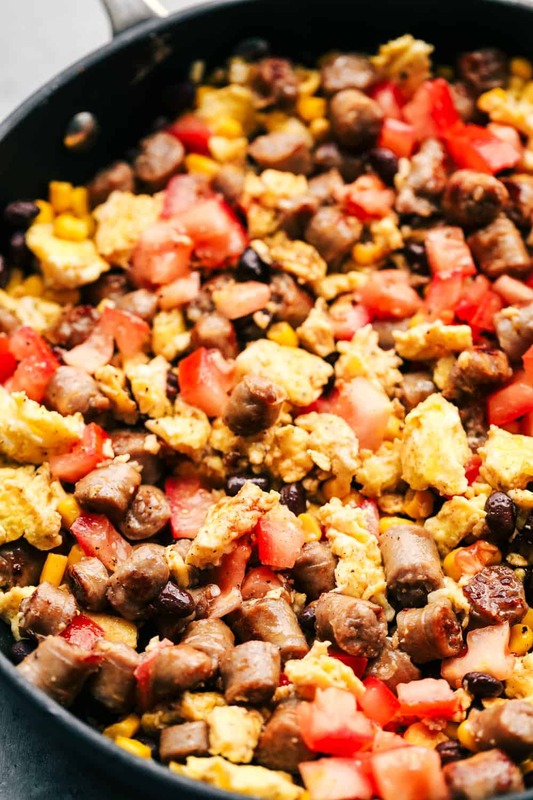 The southwest flavors and the addition of corn, rice, and tomatoes make for a flavor-packed unforgettable breakfast. My kids couldn’t seem to eat these fast enough! Isn’t it nice being able to create easy to make hearty breakfasts for your family? Need even more easy breakfast ideas? Denver Omelet Breakfast Muffins— These are great for making in advance and reheating before school. Sausage and Egg Breakfast Taquitos — You can also freeze and reheat. 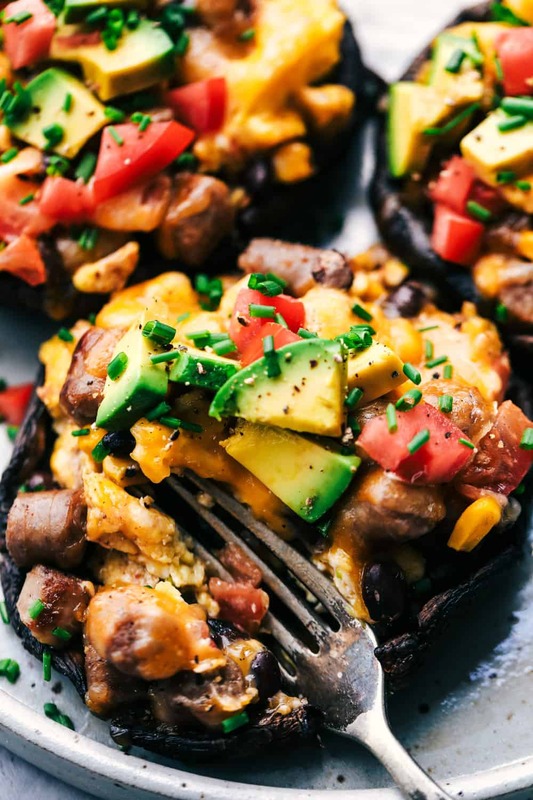 Southwest Sausage and Egg Stuffed Portobella Mushrooms have eggs, black beans, corn, tomatoes and are topped with ooey gooey cheese! An easy to make hearty breakfast for your family! Optional toppings: Sliced Avocado, diced roma tomato, and chives. Preheat oven to 400 degrees. Take off the stem from the inside of the mushroom. They should break off easily. Use a spoon and gently scrape the gills from the inside of the portobello mushroom and discard. Slice your sausage links into ½ inch pieces. Cook in a medium-sized skillet over medium-high heat until no longer pink and cooked throughout. Set aside on a plate. Add your lightly beaten egg to the hot skillet and scramble until they start to form. Add in black beans, and corn and continue to cook until eggs are ready. Add in sausage, tomato, chili powder, cumin, paprika, salt and pepper and mix. Delicious! The portobellos do need salt to counterbalance their blandness, and I roasted them well to break down the fiber – about 20+ minutes. This could easily be adapted to breakfast burritos. We will be making again!